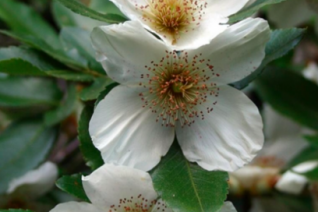 A great little evergreen tree from Tasmania that grows to 10′ tall but just a few feet wide. This columnar tree is the cold hardiest variety from Tasmania and is found at the highest elevations there. In my own garden it has never been damaged by cold in the 8 years that I’ve grown it. In July/August it is covered in small thimble sized white flowers with a cute central boss of stamens tipped with raspberry pink pollen. Full sun and infrequent but deep summer water. Avoid the reflected heat of south facing walls. Best with some afternoon shade. Excellent tree for small gardens- it fits in the tiniest places and still looks fantastic. Evergreen foliage often starts 1′ from the ground on up. Nice texture. Columnar evergreen tree that is ideally sized for small urban gardens and blooms in mid to late summer. Large white flowers are profuse on every stem. There is a central boss of long stamens tipped with pink pollen. Blooms July-August. Full sun to light overstory shade and rich soil with regular summer water to establish. To 18′ + in 10 years and less than half as wide. The evergreen divided leaves are glossy and pretty year round. Grows about 2′- 3′ a year when established. Young trees are somewhat sparse but they fill in significantly with age becoming very dense upright rounded trees with time. Locate out of the path of subfreezing east wind. If you are in a wind zone place the tree on the west or south side of a structure. In central Portland this is less of an issue. Gains tremendous cold hardiness with age. Protect young plants from temperatures below 15ºF- established plants can take brief drops to 0ºF. Amazing in bloom and wild life thinks so too. Cold damaged foliage recovers very quickly in spring- by May you would have no idea. Injury happens in cold gardens about once every 5 years. Majestic tree in age. South America. 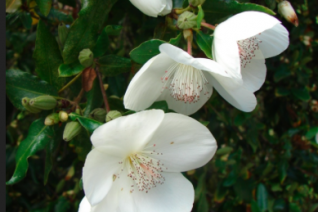 Possibly the best Eucryphia for our climate in ease of culture, amount of flowers and hardiness. This evergreen tree grows quickly when young. In youth it tends to be a somewhat sparse tree but with age it increases in density markedly. In July/August the whole tree is draped in pure white 2″ blossoms with a central boss of stamens holding raspberry pink pollen. Grows about 2′-3′ a year or more in rich, well drained soil with regular summer irrigation. Established trees can take summer drought. Cold hardiness increases dramatically with the age of the plant. Protect small trees from arctic conditions. The entire deep green leaves are good looking year round. To 18′ tall and 5′ wide in a columnar form. 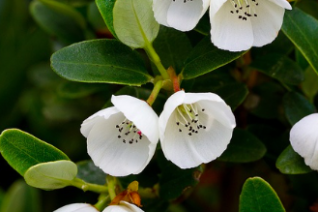 Hybrid between two Chilean Eucryphia species including the hardiest E. glutinosa (Zone 6)- it inherits cold hardiness from that parent. Full sun.